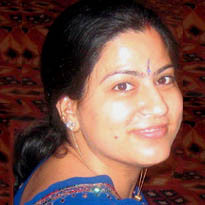 Priti Razdan is a Software Engineer by Profession working in New Delhi, India. Writing Poems is her favourite hobby. She loves writing Poems with comparisions drawn from nature. She believes that the world today has become a global village, bright youngsters have crossed national boundaries and gained success. But somebody back home is eagerly waiting for their return. Her Poem "Am I asking for too much" is a tribute to "Mothers" who leave no stone unturned for a child's comfort.